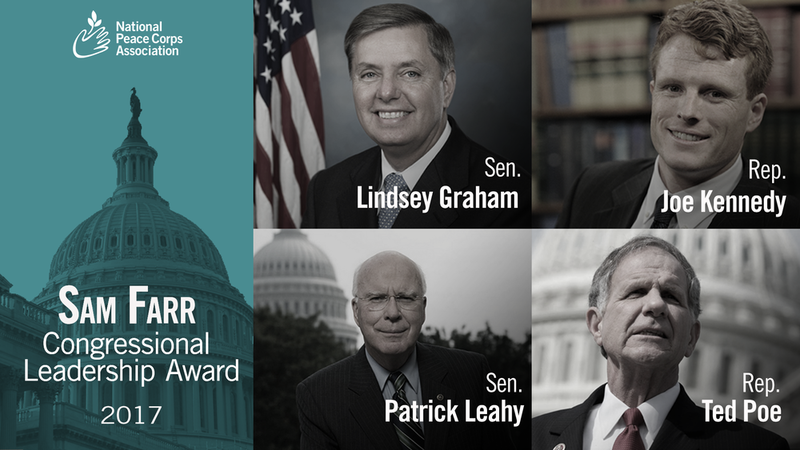 We are proud to announce the winners of the 2017 Sam Farr Congressional Leadership Award are Senator Lindsey Graham, Senator Patrick Leahy, Representative Ted Poe and Representative Joe Kennedy. As Chairman and Vice Chairman, respectively, on the Appropriations Committee, Senator Graham and Senator Leahy have worked to ensure that the Peace Corps has the funding it needs. Representative Poe and Representative Kennedy have taken up the critical task of improving the health, safety and security of currently-serving and returned Volunteers. The awards will be presented by former Representative Sam Farr during NPCA’s Capitol Hill Dayof Action on March 1st. Senator Leahy has not only made the case in the press, but he has also visited Volunteers in the field and hosted numerous promotional events on Capitol Hill and in Vermont. "President Kennedy’s vision of the Peace Corps is at least as relevant today as it was when he established it in 1961,” Senator Leahy shared. “Countless Americans have served in ways that have brought the best face of our country to foreign lands. Vermonters have led the way, time after time sending the highest number of volunteers per capita." Representative Poe (R-TX-02) and Representative Kennedy (D-MA-04) have sought to improve the health, safety and security of currently-serving and returned Volunteers through legislation they reintroduced at the beginning of this legislative calendar. H.R. 2259, the Sam Farr Peace Corps Enhancement, will make improvements in the areas of overseas medical personnel, agency support for returned Volunteers and victims of sexual assault and violence, policies and procedures for anti-malarials, worker’s compensation benefits, and reauthorization of key provisions of the Kate Puzey Peace Corps Volunteer Protection Act. Representative Poe, who also introduced the Kate Puzey Act, has long fought for agency reform in his position on the House Foreign Affairs Committee, and refers to Volunteers as “Angels Abroad.” Representative Poe believes, “Peace Corps volunteers exemplify what it means to be an American citizen, and I am proud to support our angels abroad. The Peace Corps embodies the values of hope and compassion, which is something we desperately need more of in our world today." The award is named in honor of Sam Farr, RPCV Colombia, who represented California’s 17th and 20th districts from 1993 to 2017. Known to his colleagues as “Mr. Peace Corps” for decades, Farr was among the Peace Corps’ greatest champions to serve on Capitol Hill. Register to join us for our Capitol Hill Day of Action on March 1 to meet with Members of Congress and celebrate our award winners.